"...And Out Came the Reptiles, Part Two"
In the EPF basement, Mondo Gecko goes berserk on Bishop's soldiers as Michelangelo tries to rein him in. Mondo disrobes and goes into camo mode, but Bishop overpowers him regardless. With the blast doors to the storeroom closing, Mikey and Mondo retreat and make it inside just in time (though Mondo's tail gets sliced off by the closing doors). Inside, Mikey chats with Mondo and convinces him to stop letting his emotions get the better of him. Mondo agrees to chill and soon finds all the parts Lindsey needs as well as a new jacket and hoverboard for himself. With Bishop working on reopening the doors, the pair need a means of escape. Mikey finds a Triceratank and figures its just the weapon they need. Smashing out of the storeroom with Mikey manning the tank and Mondo taking point on the hoverboard, they blast their way through the EPF soldiers and then out through the roof of the EPF building. They land the tank in a skate park, where Mondo gives his hoverboard away to a startled young skater who was practicing there. At Mutanimals HQ, Mikey gets to helping Lindsey use the stolen parts to stabilize Mutagen Man while Old Hob gives Mondo a talking to. They argue over Mondo's recklessness, but Hob eventually concedes that his rebellious actions ended up possibly saving Seymour's life. Lindsey then calls everyone in, as Mutagen Man now has a rebuilt body and his life signs have been stabilized (though perhaps not permanently). Seymour is initially not happy with Mondo having saved him, as he was at peace while in his coma and prepared to day. Mondo apologizes, but expresses that he couldn't stand by and let his friend perish. They make up and Seymour considers there might be something worth living for. Pigeon Pete finds Man Ray on the docks, looking out to sea, and asks him what he's thinking. Man Ray says he's considered living underwater and getting away from all the madness and violence of the Mutanimals. Pete interprets that as a fantasy scenario where Ray is the captain of a great ship, hunting down pirates (all played by the Mutanimals and the Turtles). Ray corrects him, but confesses that he wouldn't want to live away from his friends. As they return to HQ, Ray asks Pete not to tell Hob about what he said, but Pete has already forgotten their conversation. *This story is continued from TMNT Universe #23. 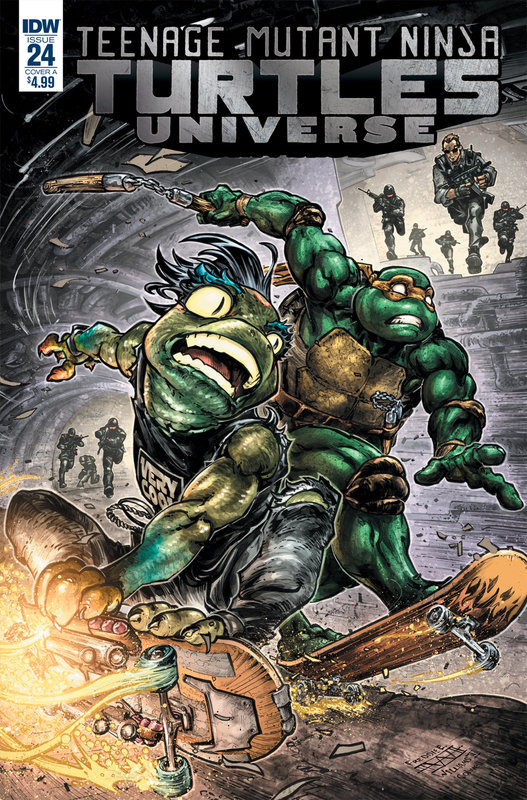 A new story begins (and ends) in TMNT Universe #25. *This issue was originally published with 3 variant covers: Cover A by Freddie E. Williams II and Jeremy Colwell, Cover B by Pablo Tunica, and Incentive Cover by Chris Johnson and Mark Englert. 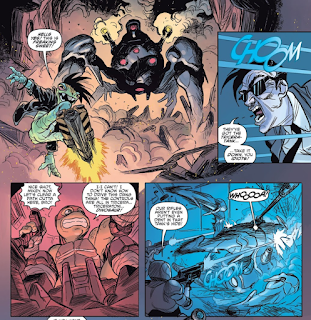 The final multi-parter for TMNT Universe, "...And Out Came the Reptiles" is a superficially simple story that tackles some very complex and emotional themes. I felt stronger about the first half of this arc than the second, but together they tell a solid tale even if the back-half is more action-loaded. 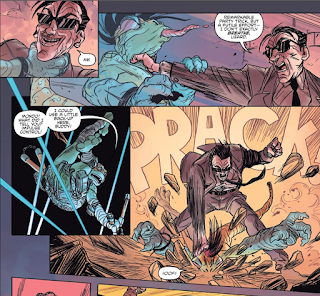 Mondo's "rebel without a cause" gimmick is given a lot of focus in this issue as everyone gives him a pep talk, encouraging him to chill. It ends about how you'd expect, with Mikey gently reminding him that Seymour's life is on the line and Hob conceding that he ultimately did the right thing, brash though it may be. Then Seymour apologizes to him for holding a grudge and they hug. Mondo gets a lot of affirmation in this issue and it does get a little tedious in rapid succession, I'll admit. Of all the different talks Mondo got, I liked the exchange with Hob the best, as Hob offers some fatherly rhetoric ("as long as you live under MY house, you obey MY rules") that drove the dynamic of their relationship home. Hopefully, future writers follow up on the father/son angle they have going on; it was one of the most interesting ideas to come out of this story. Bishop and the EPF come across as a tad pathetic in this story, as they get caught sitting on their hands and are served an embarrassing defeat over what's essentially a smash-and-grab. I don't think it takes away too much of Bishop's intimidation power, but I suppose serves as a reminder that he and his agency aren't completely invulnerable all the time. Really, it was a lucky shot that Mikey and Mondo even got out of there (convenient tank). I suppose if I was disappointed over anything, it was that Mondo didn't keep the purloined hoverboard. It could've been a cool little accessory for him to have in future adventures and fit his personality and skill set; giving it away as soon as he got it struck me as a bit of a lost opportunity (though thematically, I suppose it displayed his cooler and friendlier demeanor). The backup was cute, but not something that adds a whole lot. I enjoyed Moody's art, like I always do, and seeing the Mutanimals dressed up as pirates was kinda funny (though the Turtles are mentioned, they aren't seen in the fantasy, but c'mon; we've seen them dress as pirates plenty of times). This will be the last backup in TMNT Universe and it doesn't try to end the gimmick with any sort of bang. It's fine for what it is, but that's the highest bar any of these TMNT Universe backups have aspired to. "Fine." Anyhow, one more issue of TMNT Universe to go. I'll save my thoughts about the whole series for that review, but I'll end this one by recommending the story arc. 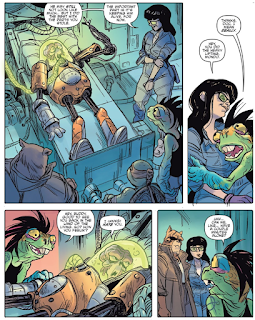 If you like the Mutanimals as much as I do, it's a no-brainer, but it certainly hits some heavier topics than you'd expect from a Turtles book. Shouldn't that be part two? Whoops! I copy-pasted the credits from the last review to save time. Fixed! I felt the the same way about Mondo giving up the hoverboard. 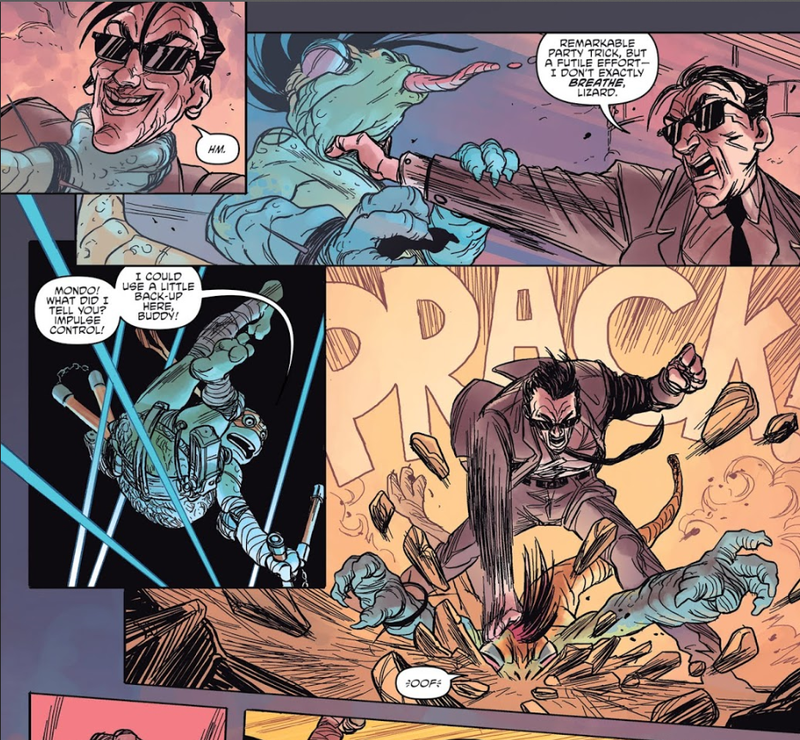 Since this was a big story for Mondo as a character, I figured they might be giving him the hoverboard as one of his main abilities going forward. That would have fit so well at the end, thematically and going forward with him having "leveled up" in this story. But nope. Otherwise I thought this was one of the better Universe stories. I really wish this book didn't have to end after months of solid issues. Re: the backup, beyond the pirate stuff, I figure it exists to give us insight that Ray is having doubts about Hob. 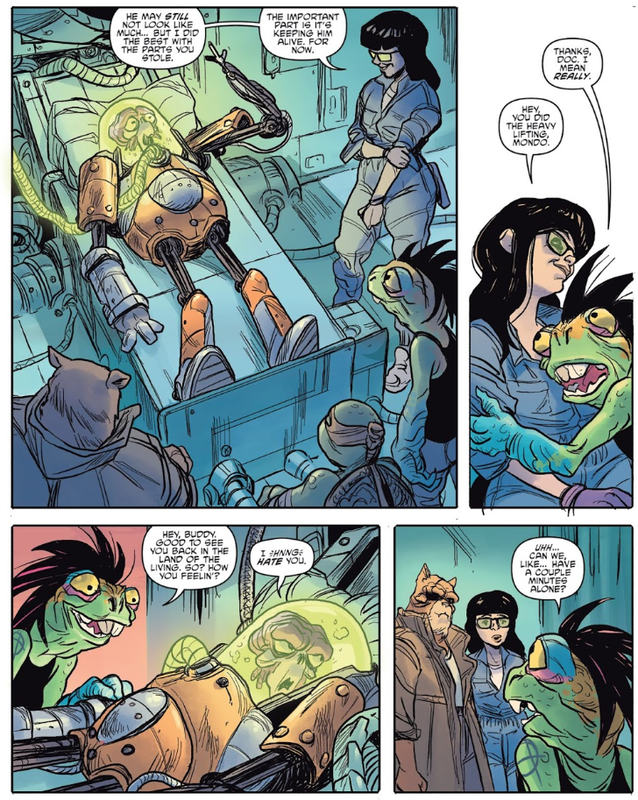 Maybe they're foreshadowing changes for the Mutanimals down the line. On the cover Mondo is wearing a shirt that says "Very Cool", a reference to a show called the Nerd Crew by RedLetterMedia. Cover artist Freddie Williams has been a guest on one of their other shows, Best of the Worst, where he seems like a heck of a nice guy. 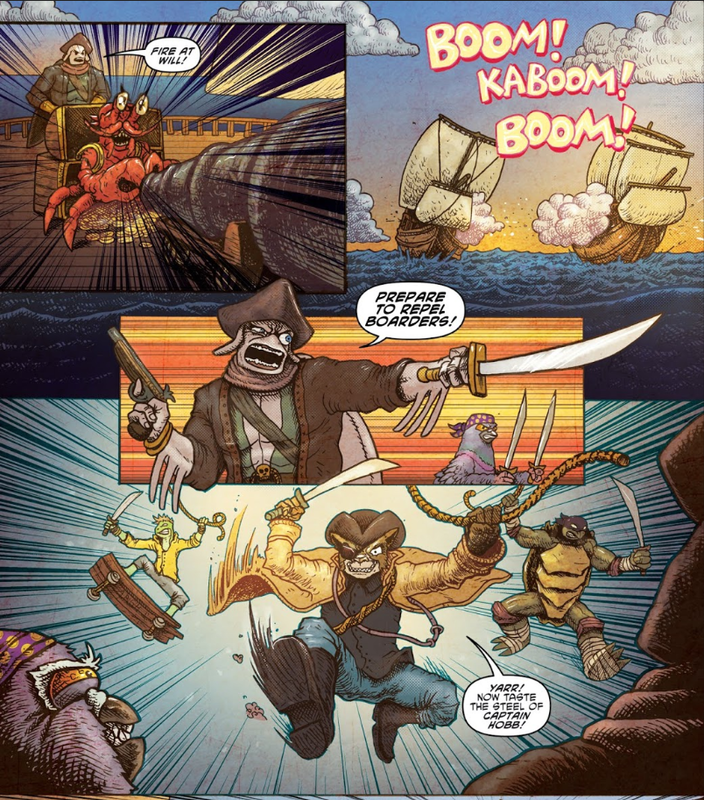 Apart from the Turtles dressing up like pirates in the comics a few times, there were also a couple of action figures of the Turtles as sea-faring strangers. Also, there's a typo in the paragraph under the picture with Mutagen Man, where you wrote 'day' instead of 'die'.